You know what I realized? Most of my recipes are not gutsy at all! I mean snickerdoodles, fruit leathers, and banana bread are great and all, but I think I have to step up the notch here with the “gutsyness”, don’t you agree? Or at least once in a while?! Don’t judge or over exaggerate over my new gutsy recipes, promise? Ok! Here is my first really tasty treat for you to try! (My family thinks it tastes like chicken. You have probably over-heard this one, but it is true!) Try to stay calm as I introduce the frog legs to you. If this picture or the thought of frog legs tasting like chicken doesn’t do the trick then I know what might! Did you now that most people are deficient in vitamin A (read about it here!). That’s because people think they can get it in the form of veggies like carrots and kale..wrong! Your body is only efficient at absorbing vitamin A through animal products. Liver is extremely high in vitamin A, but I know some of you cannot choke down the taste. It’s not that frog legs are easier to look at than beef liver, but they are tastier! 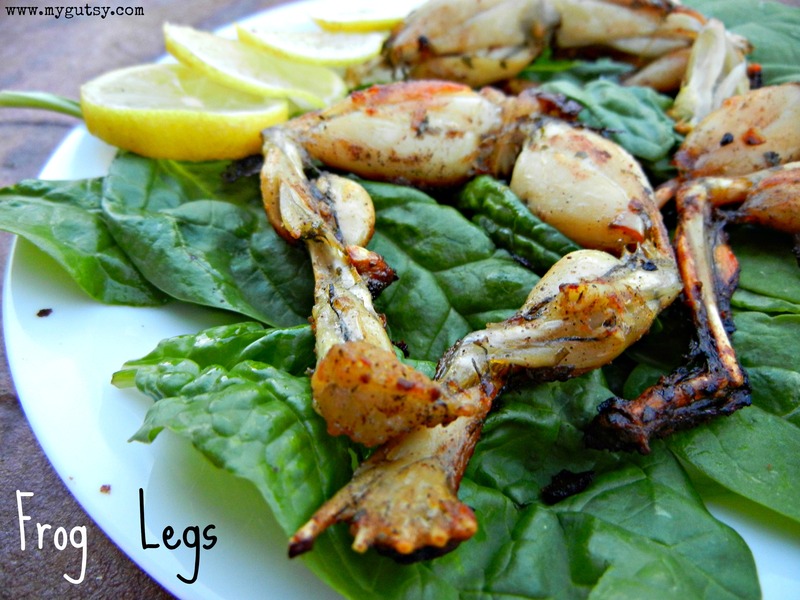 Frog legs are super rich in protein, vitamin C, omega-3’s, potassium and vitamin A (in the form your body can use!) Hooray! Rinse frog legs under cold water. Heat 1 T oil and 1 T butter in a cast iron skillet. (While legs are cooking) make sauce. Add lemon juice, parsley, butter, garlic to small pan and let simmer for 6 minutes to reduce. Add sauce on top of frog legs. Transfer cast iron skillet in oven for 15 minutes (this ensures the legs are cooked through). Serve on top of a bed of spinach and squeeze fresh lemons. Yum! I used to eat these when I was little and my mom would make them. It’s been almost 35 years since I’ve tasted the treat. Do you know where I can buy frog legs or do I catch my own? Jill so cool! haha call a meat or seafood market around you! Hi Megan, yes frog legs are good but I don’t know where the source was..hmm I will have to look into my resource thanks for that! It’s the first time that I comment here. Those frog legs do look like chicken wings (I love chicken wings), but I’m wondering where do you get them from? I’ve never seen frog legs on sale here (I live in Spain). They taste like like chicken wings too! I got them from a seafood meat market around here in the frozen section. start asking around! Oh my goodness! Now THIS is gutsy! Where do you get frog legs? I want to try them now! I had escargot when I went to France years ago, but we never tried frog legs. I’ve had escargot several times. They taste delicious with butter (or ghee) and parsley. I have had escargot several times. They taste delicious with butter (or ghee) and parsley. Hi Catherine I sure can, though it might take me a little bit. GAPS is easy when you have enough fat, meat, veggies. *Grins* Actually, you know, if I were ever stranded in a swamp, I guess it’d be good to know how to cook the one meat that I might be able to catch. 😉 Hee hee! It’d cost me a fortune to feed our family of these rather spendy items, but it sure is a novelty! I love frog legs! Thanks for sharing a GAPS friendly recipe! I will try this soon!